The three S3 pupils, Kirsty Alexander, Bella Claydon and Anna Hulme, who were involved in the Big Green Challenge Debate visited Cornwall in May. This was their prize for reaching the final of the competition. Accompanied by Ms Dean and Mr Hulme, they flew to Newquay and used a hire car to travel to sights such as St Ives, Land’s End and Truro during their four day trip. 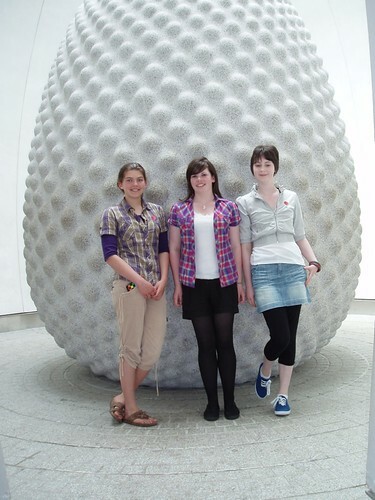 The main reason for visiting Cornwall, though, was to visit the Eden Project. The group had the benefit of an education officer who introduced the venue with its massive covered Mediterranean and Tropical gardens, its extensive outdoor Temperate garden and its impressive education centre. The group were given an insight into how an old clay quarry was transformed into a world class visitor and educational attraction and the benefits that this has brought to the Cornish economy. Two whole days were spent looking round the site which is not made up of just specimen trees and bushes but plantations of, for example, cocoa trees or tea bushes. In addition to the botanical aspects and their economic impact, there were numerous sculptures and displays on environmental issues to capture attention. Another day could easily have been spent here and the group would recommend it unanimously for anyone to visit. It was an incredible experience.